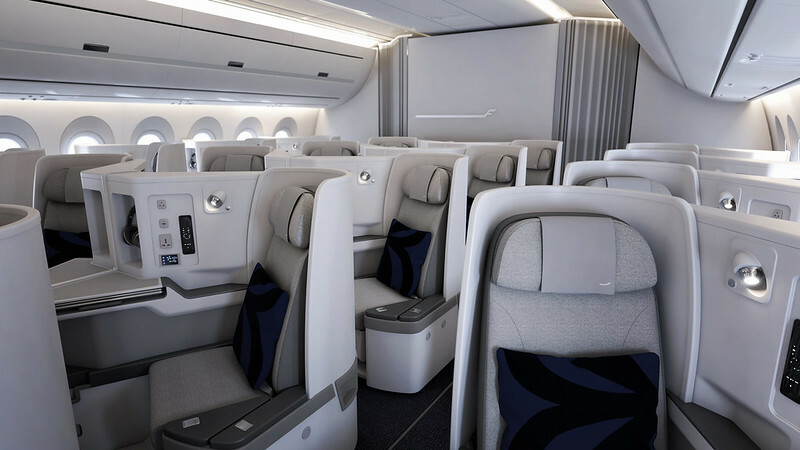 Finnair is rolling out a new design in its business class cabins. New cabin textiles and amenities, including new seat covers, and pillows, blankets and chinaware with prints from the iconic Finnish design house Marimekko are all being introduced from February 2018. The new designs aim to reflect Nordic interiors and landscapes according to David Kondo, Head of Cabin Interior Development at Finnair. “We are aiming to bring a slice of the Nordics to the aircraft cabin.” he told Business Traveller in Helsinki at the airline’s annual media day. The airline is doing so by drawing on “two major themes”, he said. “One is the Nordic interior world, and the other is landscapes, since nature is a big part of our brand,” Kondo said. The new amenity bag design is reflected in some of the tableware including the coffee mug. Future plans include probably introducing a rice bowl alongside the newdesign for the coffee cups (also in the “well” pattern). In addition to the new Nordic designs, Finnair’s new service concept will offer a wider range of dining and wine options, served on-demand. It is also introducing the Finnish tradition of “Kahvikutsut” – a coffee serving with seven different treats – for long-haul flights departing Asia in the morning. This coffee service includes traditional Finnish treats like Carelian pies, cinnamon buns, coffee cake and Finnish chocolates between the two meal services. In addition, the airline is introducing a new menu from Swedish chef Tommy Myllymäki who is the creative director for five Stockholm restaurants. Myllymäki will design menus for Finnair’s business class, and his winter menu will be served on all Finnair long-haul flights departing from Helsinki from February 2018. The winter menu has dishes such as Jerusalem artichoke with cep mushrooms and pear, and braised ox with celeriac and kale. The summer menu will have more emphasis on seasonal, crisp fresh vegetables to celebrate the freshness of the Nordic summer. The economy class menu has been designed by the Culinary Team of Finland which represents Finland in international culinary competitions. The meals will feature a marinated potato salad, lamb with oven baked turnips, and a cheese curd cake. The winter menu will be followed by seasonal menus for summer and autumn. The new services will commence from February 7, 2018, on flights to Seoul, Tokyo and Shanghai, with a gradual roll-out of the remaining long-haul destinations during the spring and summer.